While attending the University of North Carolina at Chapel Hill, Charles Kuralt was the editor of his college paper, the Daily Tar Heel. 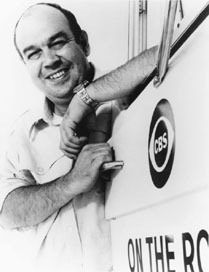 Following graduation, Kuralt joined the Charlotte News and two years later left for New York to write news copy for CBS television. Eventually he landed himself a correspondent position and became nationally-recognized as the portly, bald host of On the Road with Charles Kuralt and Sunday Morning. Somewhere along the line he also co-hosted the CBS Morning News with Diane Sawyer. During a trip to Brazil he befriended journalist Hunter S. Thompson, who was then writing for The National Observer. According to Kuralt's memoirs: "I knew him from Rio, where I had once lent him bail money to get out of jail after he had slugged a guy who had kicked a dog in a bar." It wasn't until after Kuralt's death that the extramarital affair came to light, and even then only because the woman contested his will. Apparently Kuralt had purchased a renovated schoolhouse on 90 acres in southwestern Montana, where he kept Patricia Shannon, his mistress of 29 years. He also bought her a cottage in Ireland and paid for her kids' college tuition. Over the first decade of their relationship, Kuralt gave her something like $600,000. "Charles always said, his refrain through all of his life, 'Don't worry, we're rich,' he would say. [...] Charles took care of all my needs." After a prolonged legal fight, not only did Ms. Shannon win the property in question, but Kuralt's daughters were forced to pay the mistress's estate taxes, amounting to $350,000. Brother: Wallace Hamilton Kuralt, Jr.